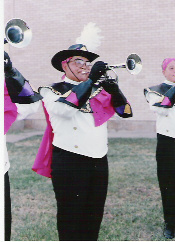 Welcome to the one and only website of the Lone Star Drum & Bugle Corps, a DCI corps based in Texas during the 1990's. 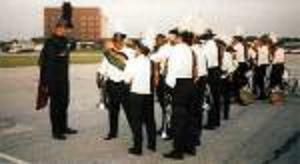 The corps helped to pave the way for drum corps to be more accepted in Texas. The purpose of this website is to act as a central repository for any and all historical information pertaining to Lone Star. It is hoped that eventually a complete history of the corps can be completed. This site also acts as a site of the history of drum corps in Texas in general. The Lone Star State has an interesting and very underestimated history of drum corps and it would be tragic for that history to simply be forgotten. 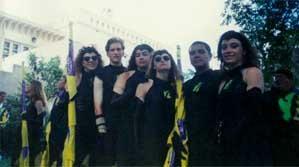 "When people ask if and where I marched, I always answer with great pride. We had something special during our short lifespan in DCI. I sure would like to see the return someday, and I'd love to be involved in that return. My biggest regret - not really getting to know many of you. I hope this site will become a spark for more friendships and relationships for all of us somehow. It's fun to get on here and read what's going on with all of you. Please keep updating yourselves." This site is a continued work in progress. Any additional information, pictures, items, stories, etc is greatly appreciated. AND SO WE'RE OFF TO FRANCE! ARE WE? I think I have finally dried off from the flooding that occurred during the Show of Shows. blub blub blub...not bad for a contra player with a broken left ankle. Just so you know, I check on this site every few days or when I get new information. There's a whole shopping list below of stuff I am looking for and have had no luck discovering them. Help a brother out! If you have any additional ideas to improve this site, let me know. If you also want to donate a dime or two to make the site ad-free and expand the memory, I would not be opposed (I'd even place a special thanks for you on the website). What success that has occurred here now and will occur in the future depends on its former members. Keep in contact and help to add to the growing amount of information we have. I still have the goal of having a complete archive of Lone Star. If you have it, I WANT IT! Thanks for all the help folks! The complete roster of the 1991 Corps!! !